Walking frames come in different shapes and sizes and meet a range of needs. It is important to know what you are looking for before you buy one. Why use a walking frame? 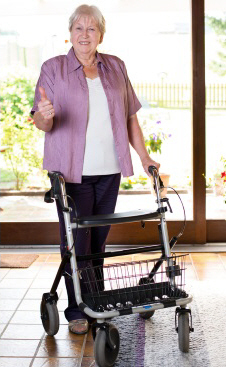 People are often reluctant to consider using a walking frame. They may wait until they are told to use one by a health professional, or until they feel so unsafe walking that they have no choice. The right walking frame should not only keep you safe but should actually open up your world, allowing you to walk further, for longer, and keep doing the things you love. Don't wait until you're desperate; think of a frame as just another tool to help you enjoy life. Some people choose to use a frame to allow them to get out beyond their garden gate, and others find they need one just to get around the house. If you cannot walk safely within your own home you may meet the criteria to get a walking frame through the Ministry of Health (via Enable). Ask your GP to refer you to a physiotherapist who can give you advice about your mobility and assess you for this. If you are buying a frame yourself it can be expensive, so it's important you get the right one. You may like to print off this guide and take it shopping with you! What purpose will it fulfil? Think about why you need a walking frame and where you are likely to use it. If it will be indoors and you have a small house you will need a small frame that turns easily. If you are using it to go for long walks outside on rough ground you will need a sturdy frame with large wheels and, possibly, a seat. Most frames are four-wheeled and this is a safe, stable option. For very small houses you may be encouraged to consider a three-wheeled frame but these are less stable and may not be safe if you have trouble with your balance. It is possible to get some very small, stable four-wheeled options for small environments. If you will only use your frame indoors or out on very flat surfaces you may not need brakes. Brakes are useful if you will ever go up or down a slope or steps, or if you sometimes find yourself walking too quickly and need to slow down (for example some people with Parkinson disease). 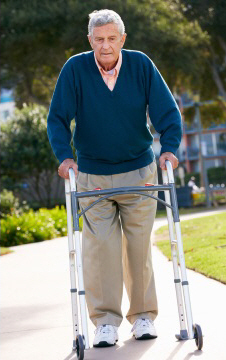 If you have a walking frame with brakes, make sure you can easily put the brakes on and take them off again. Do I need a seat? A seat can be very useful if you get tired or breathless when out walking. It can allow you to go further, more confidently, as you are able to stop and rest. On the negative side, a seat does mean a bigger, bulkier frame that is further away from you and can cause you to lean forward a little. Bear in mind that the seats on walking frames are not designed to be sat in for a long period and you should not sit on your frame and have somebody push you! If you often need someone to push you, consider buying or hiring a wheelchair. Most walking frames have wheels, but it is possible to get some that have four stoppers instead. These are fantastic for people who walk slowly and have poor balance or difficulty taking weight on their legs. They are very safe as they can't run away, but they do limit walking speed, as you need to lift them forward at each step. Will I need a folding frame? Most walking frames are able to be folded but can fold in different ways. If you will need to take your frame out in a car or taxi you should check that it folds neatly and is not too heavy to lift into a car boot. Do I need a basket and tray? Baskets or bags can be incredibly useful if you are going out to the shops, but do add extra weight and bulk to your frame. Look for a basket or bag that you can easily take off when you don't need it. If you will be using a frame indoors, then a basket and tray combination is fantastic to ensure you always have your phone nearby, tissues, your book, knitting or anything else you need! They can become a portable coffee table, but be careful not to overload them. Most mobility shops hold the basic models. If you do not think a basic model will meet your needs you can get all sorts of accessories, such as armrests, single arm steering options, holders for oxygen bottles, comfortable handles for arthritic hands – there are numerous options. Have a good talk to the supplier about all your needs or have a thorough assessment with a physiotherapist if you need anything extra. It is important your frame is the right height for you. If it is too low you will start leaning forward, and if it is too high it won't provide the proper support. When you push your frame your elbows should be slightly bent and your shoulders should not be hunched up. If you're not sure if your frame is at the right height, ask a physiotherapist to check it for you. Written by Jessie Snowdon (physiotherapist), On the Go Physio, Christchurch. Copyright 2011. Adapted by HealthInfo clinical advisers. Last reviewed August 2017.